There is a definite learning curve in the marathon. Tips and tricks are passed on from coach to runner, from veterans to first-timers. A successful race is the result of managing many small tasks. By planning ahead, you can make your marathon experience a whole lot smoother. Practice everything! In your long runs leading up to the marathon, you should try the shoes, apparel, breakfast, drink and/or gel that you think you will use on race day. It’s better to discover if something doesn’t work on a long run than during the marathon. Check the race website in advance to find out what fluids will be available on course. You can choose whether to supplement with the fuel on course or carry a different product of your choice. Experienced runners should have a goal time, but have some flexibility in that goal for dealing with weather and other factors on race-day. I like having a primary goal and a stretch goal, but it’s also good to have a slower time in mind that may you’ll be OK with if weather forces a slower pace. Just finishing 26.2 is a huge accomplishment, even if you have to adjust your goal time. I encourage new runners to focus on finishing their first marathon, rather than on hitting a specific time. There should be lots of entertainment to enjoy along the course, and running a solid, fun first marathon will set you up well for a more specific goal at your next race! Soak up the energy of the race, but start conservatively so you can have fun during the second half. The last 6 miles feel as hard as the first 20, so you should plan to save plenty of energy for the final miles. Many runners get caught up in the excitement of the marathon and start out too fast. The early miles always feel easy, but any time “banked” is often given back later. It’s always easier to make up time if you start a little slow than to recover from starting too fast. Don’t get caught up in someone else’s pace. Even among runners with the same goal time, you may find that one runner is stronger running uphill, while another is stronger on downhill or flat segments. This can cause an awkward feeling of surges throughout the race, which is more difficult than maintaining the pace that is right for YOU. If you want to run with a pace group, allow yourself the option of pulling slightly ahead or even dropping a little behind during segments where the pace doesn’t feel quite right. Remember that pacers run a steady pace for 26.2, which might not mean a steady effort over hills. If you’re expecting cool weather at the start, add some layers that you can pull off mid-race if you warm up or if the fabric rubs you wrong. You can cut the toes off of some tube socks to make arm-warmers, and if needed, wear some “throw-away” gloves and a hat that you can toss as you warm up. 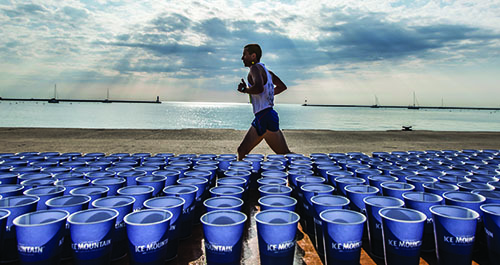 Drinking too much plain water before and during the race can be a serious problem. It can throw off your electrolyte balance, causing a risk of hyponatremia (low sodium concentration). Runners are at a greater risk of hyponatremia if they take water at all aid stations and don’t consume adequate electrolytes to maintain sodium balance. To prevent hyponatremia, you should consume electrolytes with some of your water in the days before the marathon and during the race. You can mix in an electrolyte drink or eat whole foods containing electrolytes. Leading up to race-day, good electrolyte sources include bananas & avocado for potassium, dairy products (if you tolerate them) and green leafy vegetables for calcium, and chicken broth or other salty foods for sodium. On race morning you’ll want to stick with lighter foods for breakfast, mixing carbs & protein. My favorite pre-race meal is a banana with mixed nuts. Eaten 2-3 hours before the race, it provides sodium and potassium, along with carbs, and some protein & healthy fat. A marathon is a lot to manage. Make a plan, but allow some flexibility if things don’t go exactly right. We look forward to seeing you at the finish line!